Definition at line 44 of file Ip.h. Definition at line 53 of file Ip.h. Definition at line 50 of file Ip.h. Definition at line 494 of file Ip.cc. Definition at line 510 of file Ip.cc. Definition at line 518 of file Ip.cc. Implemented in ACLDestinationIP, ACLLocalIP, and ACLSourceIP. Referenced by ACLSourceIP::match(), ACLLocalIP::match(), and ACLDestinationIP::match(). Definition at line 524 of file Ip.cc. References aclIpAddrNetworkCompare(), acl_ip_data::addr1, acl_ip_data::addr2, data, debugs, acl_ip_data::mask, NULL, and Ip::Address::setEmpty(). Definition at line 29 of file Ip.cc. Definition at line 22 of file Ip.cc. Definition at line 475 of file Ip.cc. References data, acl_ip_data::FactoryParse(), acl_ip_data::NetworkCompare(), acl_ip_data::next, NULL, and ConfigParser::strtokFile(). 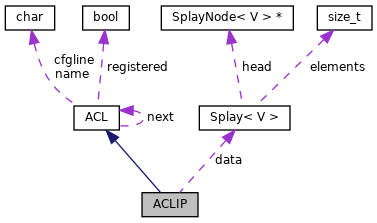 Reimplemented in ACLExternal, ACLStrategised< M >, ACLProxyAuth, ACLMaxConnection, ACLMaxUserIP, and ACLRandom. Definition at line 115 of file Acl.cc. Definition at line 65 of file Ip.h.